A Women’s Institute group who stripped off for a charity calendar shoot have raised nearly £10,000 for charity. Fifteen members of Tytherington Treacles WI bared all in a daring, 2019 calendar shoot in aid of the Victoria Breast Screening Centre in Macclesfield. Funds raised from sales of the calendar were further boosted by a prize raffle draw and sponsorship from local businesses. 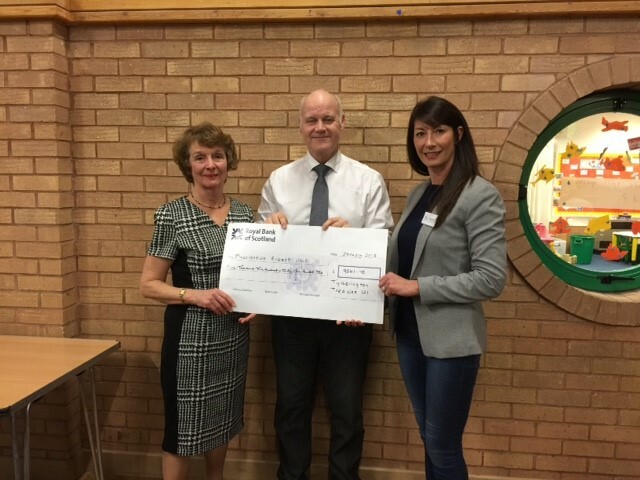 At a recent presentation, the Calendar Girls proudly handed over a cheque for £9,541.75 to Mike Crotch-Harvey, Consultant at the Breast Unit at Macclesfield. The cash will help pay for a new ultra-sound machine and other vital equipment at the unit, which aims to detect cancers early. ‘Early detection may mean simpler and more successful treatment. Today, breast cancer screening saves around 1,300 lives every year,’ said Valerie Jones, Secretary of Tytherington Treacles WI. Fancy joining the WI? Tytherington Treacles would love to welcome you into their group of amazing ladies. Formed in 2016, this vibrant group of community-minded women enjoy a varied programme from reflexology and chocolate crafting to tribal dance and self-defence, along with many interesting speakers. Monthly meetings (7.30 pm) are held at Marlborough Primary School, Tytherington Drive, SK10 2HJ on the second Monday of every month (except August). Guests welcome (£4 admission).